The Cavs hit a new low Sunday night, falling 117-115 to the Hawks at home. The Hawks came to Quicken Loans Arena with an eight-game losing streak ever since beating the Mavericks — who are 1-10 — on opening night. They proceeded to tear up the Cavs’ defense, as everyone else has this season, with a pair of 37-point quarters and 54.1 effective field goal percentage. As ugly as Sunday’s performance was for Cleveland, their fans still received some pick-me-up news before the game. 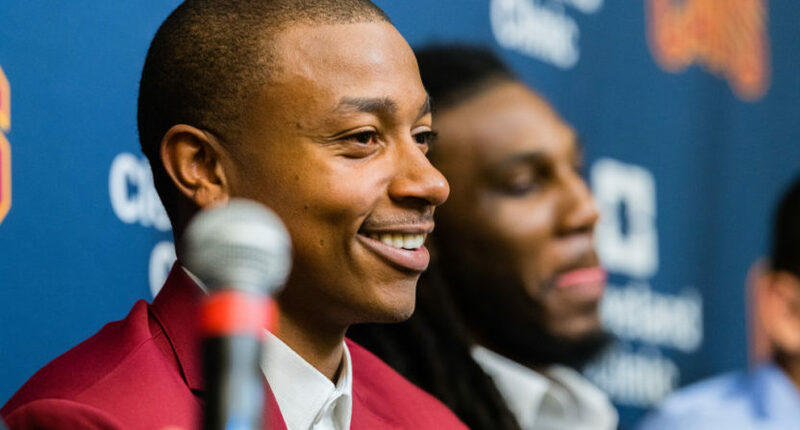 Coach Tyronn Lue told media Isaiah Thomas’ timetable to return from his hip injury has accelerated, which means he should be back before the end of the calendar year. The Cavs made a landmark deal for Thomas this offseason, dealing Kyrie Irving to the Celtics for the 5’9″ guard, Jae Crowder, and additional assets. But Thomas’ hip injury, suffered during Game 2 of the Eastern Conference Finals, has left Cleveland starting Derrick Rose, who’s put up a 13.7 PER in six games. Rose isn’t nearly the scorer or playmaker Thomas is, but offense hasn’t been Cleveland’s main problem. Teams have let LeBron James dominate to the tune of 28.8 points and 9.1 assists per game with a 64.6 eFG%. But without an elite secondary playmaker like Irving or Thomas, opponents have locked down LeBron’s supporting cast. Most nights, that strategy has worked. Other times, like on Friday when James dropped 57 points against the Wizards, it hasn’t. Whenever Isaiah Thomas returns, he’ll force opponents to change their game plan. Thomas is a nasty offensive player. As he made sure everyone remembered on Twitter last night, he tore up the league last season, averaging 28.9 points and 5.9 assists with a 113.6 offensive rating to finish fifth in MVP voting. But Thomas’ defense was a problem all season, and that won’t change when he returns to the Cavs. He ranked second-t0-last in ESPN.com’s defensive real plus/minus, and Boston’s defensive rating was nine points better when he was off the court. Through 10 games, the Cavs have the worst defensive efficiency in the NBA, allowing 111.7 points per 100 possessions. Some of the league’s worst offenses have gone to town on them. The Hawks (26th out of 30) put up a 114.5 offensive rating on Sunday. The Pelicans (22nd) posted a 122.7 last week. The Bulls (30th) scored 121.7 points per 100 possessions two weeks ago. Cleveland’s main lineup of James, Kevin Love, J.R. Smith, Jae Crowder, and Rose has allowed 133.5 points per 100 possessions. 133.5! There’s no reason to think that replacing Rose with a healthy Thomas would make those numbers any better. Getting Thomas back will mean LeBron no longer has to play like Playoff LeBron to win regular season games against average teams. The offense will benefit, and that will help mask some of Cleveland’s defensive problems. But until they make major changes defensively, the Cavs shouldn’t pin their championship hopes on Thomas’ return.